Fish Aloko is an Ethiopian food recipe with bananas, tomatoes, onions and potatoes. 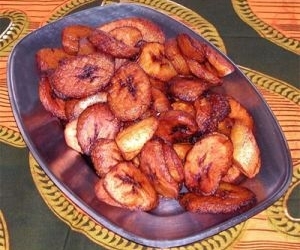 Cut the plantain bananas and sweet potatoes into small diced cubes and fry in hot oil in a large frying pan. Cut tomatoes and onions into small pieces. Put them in a bowl. Mix oil, vinegar, salt, pepper and stock cube. Make a chilli sauce with onion, salt and pepper in a pan. Clean fish if it’s fresh – once with water, then with lemon and put in a bowl. Mix the flour, eggs, salt, pepper and the stock cube. Coat the fish pieces in this mixture. Put oil in a skillet until the oil is heated to bring the fish and cook until browned, then remove. Chop the onion and pimientos, fry in a hot pan with a little oil. Add the tomatoes and season to taste.